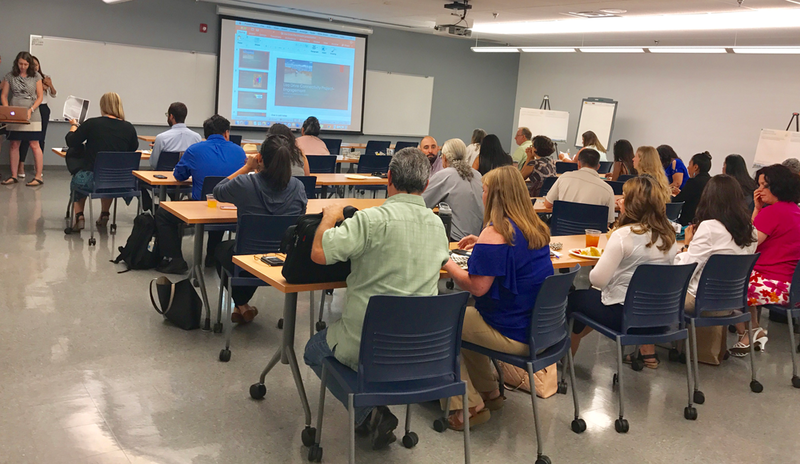 Among Plan4Health New Mexico’s partnerships developed through our assessment process was an important collaboration with the New Mexico Community Data Collaborative (NMCDC), an interactive public health data and mapping resource maintained by the New Mexico Deparment of Health. NMCDC was an important partner in identifying collaborators for outreach events we led in each of the state’s four quadrants, as well as a resource for technical and advisory support in structuring our final roundtable and determining the form of our final report. NMCDC’s principal project is the data warehouse and interactive website at ArcGIS Online where analysts and advocates share datasets from multiple sources. The interactive functions of ArcGIS Online facilitate group exploration of health and education issues. The purpose of these data is to inform evidence-based decision making in New Mexico to plan and improve health and education service delivery, evaluate interventions and systems, and inform policy decisions. The maps are being used to facilitate group discussions, participatory data exploration and collaborative decision making. Users are incorporating the data and the maps into community health council assessments, grant proposals, public health program planning and management, efficient targeting of resources, health impact assessments and policy debates. While some members of our chapter and broader network have used NMCDC as a resource in the past, the assessment provided an opportunity to deepen existing relationships, to draw on NMCDC’s own unique network and resources, and to offer training in use of the online mapping commons. We were also able to offer a workshop to our roundtable participants in accessing and using NMCDC’s informational resources via the ArcGIS platform. Planners4Health roundtable in New Mexico. Photo courtesy Plan4Health New Mexico. NMCDC’s valuable tools and data, as well as its commitment to open-source public information and conducting capacity-building trainings, demonstrate one path for enabling the integration of planning and health work. One outcome of our relationship with NMCDC was its support in the development of story maps for our assessment, of which we created three. Story maps are a format supported by GIS platforms which combine narrative and multimedia content with interactive maps. Our use of story maps felt consistent with the common themes of our assessment process, in which the use and visualization of data was a frequent topic, and in which regional differences and geography played a large role in informing our understanding of statewide context. Many of our collaborators were already familiar with the format, making it a relevant tool for communicating with our networks. Finally, story maps provide a graphic, interactive method for disseminating various data sets we collected during the assessment process from the project website, which remains active as a stable informational resource. Our first, and most comprehensive, story map contains our assessment summary, which briefly outlines our methods and findings side-by-side with maps, graphics, and datasets. The concise format is an accessible method to present information about the project side-by-side with relevant data, and exists on the website as an engaging introduction to the whole report. Click the image to view the online map. One major point which arose via our survey results, and which was corroborated by our regional meetings, was the disconnect in language and communication between disciplines, as well as between communities. Use of jargon as well as different definitions of similar terms and common phrases were identified as barriers to effective dialogue and collaboration between professionals in different fields. A recurrent theme in conversations was that in many cases, adequate information and data relevant to systemic health disparities already exists between both fields, but the challenges in visualizing, presenting, and sharing that information are what ultimately contribute to or reinforce professional siloing. The methods in which data is visualized, presented, and shared inherently shape the dialogue which will follow, and so mutually accessible strategies are key to developing and enabling cross-disciplinary collaboration. We found the story map format to be one which in some ways addressed these communication gaps between disciplines and communities in presenting the assessment summary to partners and our overall network. Our second story map, “Planning and Health Networks in NM,” built on findings from our initial survey and from a collaborative mapping activity we led during each of our four regional events. We developed network maps in tandem with our collaborators at regional meetings, illustrating existing support networks in each quadrant of the state, as well as identifying aspirational networks and areas which could use extra attention, connectivity, and support from institutions and organizations. P4HNM team members then worked with NMCDC to geocode the locations of organizations and create a second story map which gives a statewide overview of existing networks, a closer look at each quadrant’s identified networks, and which details the outcomes of the aspirational networking activity. This map also is designed to bolster a sense of connectivity between the networks identified, and to support networking and new relationships for organizations, individuals, and communities who were not identified within the first rounds of the mapping activity. The third and final story map, “Four Themes in Health and Planning in New Mexico,” shares data and success stories on four themes at the intersection of health and planning. This map deals more specifically with recommendations and strategies related to integrating health and planning in New Mexico, supported by specific examples of initiatives, organizations, and projects around the state which have had success in targeting disparities in different areas. The project website and these story maps create a stable informational resource and networking hub for the public and for planning and health professionals in the state of New Mexico. By leveraging tools and resources already in use within our partnering organizations and networks, we hope to have created an accessible and relevant resource to continue strengthening the integration of health and planning statewide. Cecilia McKinnon is the Plan4Health New Mexico intern.